E-A-R UltraFit reusable ear plugs in the patented E-A-R yellow color, are made with a unique triple-flange design with rounded flanges that provide an uncommonly comfortable fit. The tapered shape fits a wide variety of ear canal sizes so you do not need different sizes to fit your entire workforce. 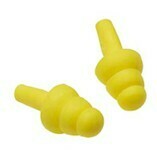 Made of soft, tough and durable pre-molded silicone rubber, Ultra-Fit ear plugs are washable with mild soap and water. With proper care, Ultra Fit ear plugs are good for daily use over many months, making Ultra Fit ear plugs one of the top-selling reusable ear plugs in the world. Highly recommended for personal use and use on the job. Tip for motorcyclists: Use scissors to trim the stem as short as you need to wear Ultra Fit ear plugs under your helmet. E-A-R UltraFit Reusable Ear Plugs (NRR 25)5B RiceOctober 18, 2018I've tried other yellow ear plugs from the big box stores and they work ok, but they hurt my ear canals when I wear them all day at work. I dont have that problem with these plugs. I can wear them all day at work ( 12 hours ) and they dont hurt my ear canals. When I need more I will be ordering more of these. E-A-R UltraFit Reusable Ear Plugs (NRR 25)5Tim B.June 9, 2018This is a perfect ear plug for loud factory noise and I am a repeat customer. They last for a good period of time. I will buy again! E-A-R UltraFit Reusable Ear Plugs (NRR 25)1PhilMarch 4, 2018I bought the same model I had for years, but this time all membranes of the product are too small and leak water. From Ear Plug Superstore: Phil, based on other reviews of this plug, we can only think you may not have achieved a good seal when they were inserted. Please let us know at info@earplugstore.com if you have questions. E-A-R UltraFit Reusable Ear Plugs (NRR 25)3Don BMay 2, 2017Of all the ones I have tried, these are the best at blocking out the TV while I am going to sleep. My ear canals are shaped differently, but the three-flange construction of the plugs allow them to fit both ears perfectly as they adapt to each ear's size. It's amazing how well they block the television my wife watches so she can fall asleep. I will use them for the rest of my life. Very very happy with them. E-A-R UltraFit Reusable Ear Plugs (NRR 25)5jbJuly 18, 2016great product...been using these for several years! E-A-R UltraFit Reusable Ear Plugs (NRR 25)5TondoJune 13, 2016I use these for lawn mowing (while placing full size headphones over them) and they really help to bring the decibels to a manageable level. Not that great for sleeping, since they have a stiff stem and are uncomfortable for side-sleepers. Overall - highly recommended! E-A-R UltraFit Reusable Ear Plugs (NRR 25)5david benedettoAugust 5, 2015i use these frequently and i LOVE them. for short term use, these are the only ones i will use. E-A-R UltraFit Reusable Ear Plugs (NRR 25)5TracyJuly 31, 2015Been using these for years. They have the best "seal" to cut out noise and or water that I have found. E-A-R UltraFit Reusable Ear Plugs (NRR 25)5Chris R.April 29, 2015I've been using these for years. They are so comfortable you can forget they're in, and you can 't beat the price on earplugstore.com. E-A-R UltraFit Reusable Ear Plugs (NRR 25)5TimOctober 20, 2014These are great earplugs!! Very reasonably priced. E-A-R UltraFit Reusable Ear Plugs (NRR 25)5SiggyMay 25, 2014I have been using these for a number of years. They successfully cut out terrible truck noise and dogs barking in the neighbourhood at night. The stems can be shortened so it is easy to sleep with them inserted into the ear canals. They can also be washed (e.g. in warm water with a few drops of dishwasher detergent added). After a few months however, they adjust to the ear canal shape sort of and then they seal less perfect. Then it is time to use a new pair. E-A-R UltraFit Reusable Ear Plugs (NRR 25)5Lenore PooleNovember 8, 2013I've been an ear plug customer for several years and have used this style of ear plugs for more than a year. They keep out the snoring sounds, the annoying barking of neighbor dogs late at night and the fan noise from our heat pump that had to be installed outside the bedroom wall. THANK YOU! I have at least one pair of these handy when I travel. They reduce airplace noise and block unfamiliar sounds in hotels. I can hear, however, if someone yells "FIRE!" I am grateful and order 5 pr at a time. They are easy to keep clean. I will keep ordering as long as I need them. E-A-R UltraFit Reusable Ear Plugs (NRR 25)5jimJanuary 19, 2013The 3M earplugs were exactly what I wanted, the price was great and the shipping was fast. I will definitely return to Earplug when I use the earplugs I purchased. E-A-R UltraFit Reusable Ear Plugs (NRR 25)5SLWJanuary 18, 2013Whenever I needed earplugs, the Earplug Superstore is where I'd buy them. A wide array of products and fast shipping of orders. E-A-R UltraFit Reusable Ear Plugs (NRR 25)5TimSeptember 17, 2012These are perfect for 90-100 db. Very comfortable! E-A-R UltraFit Reusable Ear Plugs (NRR 25)4KurtMarch 3, 2012These are comfortable, definitely sound-blocking, pretty easy to clean, and easier to get in than the foam ones that have to be squished/rolled. Wish they were flesh-color, though so they arent as obvious. But definitely are the best 25db cutting re-useable earplugs I could find on the net and definitely cheaper than my nearly $200 custom made ones. E-A-R UltraFit Reusable Ear Plugs (NRR 25)5KatFebruary 20, 2012Comfortable and very easy to use. Best I've had. E-A-R UltraFit Reusable Ear Plugs (NRR 25)5Chris R.December 9, 2011These are my favorites. They last a long time and give solid peace. I'm not sure how the seller is able to ship as fast as they do, but the order was in my box two days after ordering. E-A-R UltraFit Reusable Ear Plugs (NRR 25)4shelley kramerAugust 9, 2011these were the best of the ones I just ordered, they plug up the ear pretty good, but do hurt if pushed in too far. They block out most of the nose but again do not block out the snoring. E-A-R UltraFit Reusable Ear Plugs (NRR 25)5kvincentJuly 20, 2011I am very pleased with these ear plugs, although I have not used them yet. I have a single pair of ear plugs I have had for years -- I use them for sleeping. I had wanted to get replacement sets, but until I had not been able to find any that resembled the ones I already own. These ear plugs are almost identical. I tried them on, and they fit snugly in my ear canal. I always have problems with this, because I think I have gigantic ear holes! Nothing -- ear buds, etc. -- will ever stay in! These should do the trick perfectly. Thank you! E-A-R UltraFit Reusable Ear Plugs (NRR 25)5TracyJune 15, 2011I have been using these earplugs for many years. I cut the stem off so I can sleep with them. These are the best noise reduction ear plugs I have found. E-A-R UltraFit Reusable Ear Plugs (NRR 25)5SiggyApril 25, 2011I'm using these E-A-R Ultrafit for peaceful sleeping. I cut approx. 8mm (1/3 of an inch) off the stems so they do not stick out too much. They can even cut out party noise next door, if it is not too terrible.